Combat fatigues may soon be doing double duty as a power source for soldiers. The British Ministry of Defense just awarded a research grant to Intelligent Textiles Limited, a British company specializing in wearable technology, to develop conductive fabrics that could power radios and weapons, serving as an alternative to batteries and helping reduce soldiers’ load in the field. (Imagine how popular these uniforms would have been with American soldiers in the early days of the Iraq war, when batteries were practically impossible to come by.) By being able to store and conduct electricity, these textiles could have a wide array of other applications, from computer keyboards (pictured) to medical devices. These uniforms seem to be meant primarily to serve the needs of soldiers. 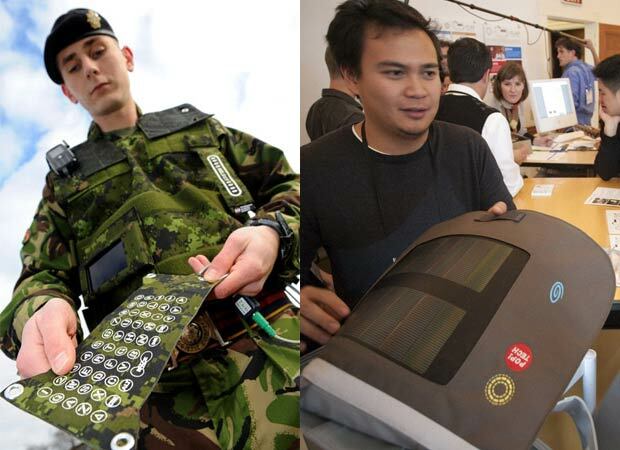 But in a time when the military often serves a peacekeeping role, it’s possible to imagine soldiers using these conductive textiles to bring power to the people, literally, thusly winning hearts and minds. That was the objective of last year’s Flexible Light and Power bag initiative, another attempt to create fabric that stores power, but one with a dramatically different agenda. A messenger bag designed to provide electricity to the developing world, it’s been used for everything from charging cell phones in African villages to emergency response in Haiti, sometimes after being taken apart and integrated into local textiles. The example of the FLAP bag offers some insight into how British soldiers’ new duds could serve humanitarian ends as well as military ones, helping peacekeepers and aid workers calm the world’s hot spots.